A new law allowing dying patients to be treated with untested medicines has reportedly moved a step closer after the government gave its backing to the plan. The health secretary, Jeremy Hunt, is throwing his department’s weight behind a backbench bill which will be debated in parliament this week, according to the Daily Telegraph. Conservative peer Lord Saatchi’s medical innovation bill aims to give legal protection to doctors who try out different procedures or treatments when they have exhausted other options. 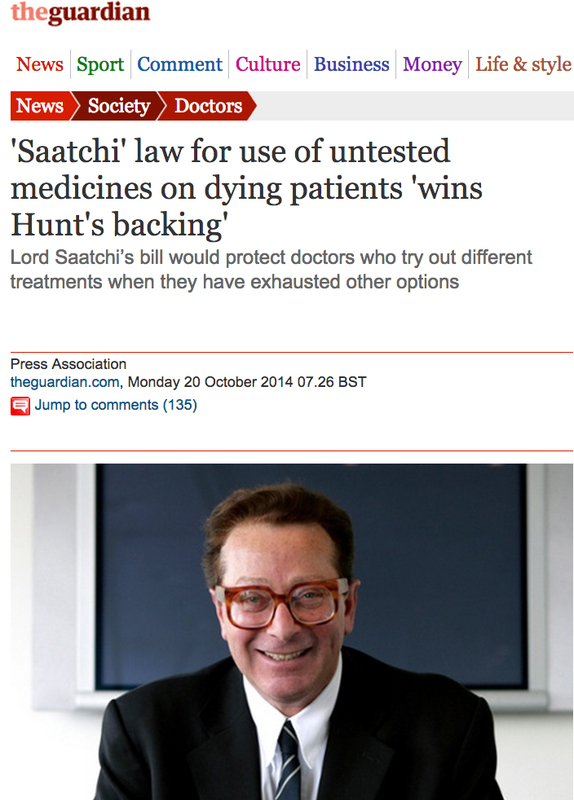 The legislation will have its detailed committee stage debate on Friday, and the Department of Health (DH) said Saatchi had tabled amendments adding extra safeguards to the bill. The peer, who began campaigning on the issue after his wife Josephine Hart died from ovarian cancer, told the Telegraph: “In dealing with the deadly Ebola outbreak, the World Health Organisation has decided that departure from standard evidence-based treatment is fully justified and essential. When the bill had its second reading in June, Saatchi told peers: “All cancer deaths are wasted lives. Scientific knowledge has not advance by one centimetre as a result of all these deaths, because the current law requires the deceased receive only the standard procedure – the endless repetition of a failed experiment. It is understood that the DH is minded to support the bill, which would have to complete its passage through the Lords and then go through all its Commons stages before becoming law.